Since 1998, Google has used its homepage to host an invariably inventive ‘doodle’. The Google Doodle actually began its life as a humorous out-of-office message for the company’s co-founders, Sergey Brin and Larry Page. To let everyone know they had gone to the Burning Man festival, they placed the festival’s icon behind the second ‘o’ on their own company’s logo. It is fitting that what has become a forum for sophisticated artistic and technical expression began life as a stick figure. We can trace the Doodle’s development over time from a simple stick man to an interactive multimedia hub that educates and entertains on a variety of subjects. Google began experimenting with Doodles to mark historical events soon after the original Burning Man example and, such was its popularity, the Doodle became a daily fixture on the Google homepage. That’s not the kind of damage a doodle can undo. These are important cases that raise probing questions for all of us. Nonetheless, it is still worth reflecting on the positive side of Google’s contributions to society. That’s where the humble, charming Doodle comes in. These sketches showcase Google at its best. They are a microcosm of the search giant’s philanthropic side, an insight into a company that (until recently) proudly held the mantra “Don’t be evil” at the core of its code of conduct. A company with so much power over the public consciousness uses its homepage to highlight overlooked historical figures, educate the populace about important scientific theories, or just give us some really fun games to play. You can take a look through the expansive repository of over 2,000 Doodles here. Within this article, we have selected just 10 of Google’s most amiable animations from through the years. For the first few years of the Doodle’s existence, it tended to appear sporadically – often to mark national holidays. That all changed in 2001 with the depiction of the Google logo in an Impressionistic style to celebrate 161 years since the French painter Claude Monet’s birth. The shimmering effect of light in the letters and the presence of waterlilies underneath serve as elegant echoes of Monet’s trademark style. Importantly, this marked a shift in direction – both thematically and aesthetically – for the Doodle. Other noteworthy homages to artists include Wassily Kandinsky, Carlos Mérida, Gustav Klimt, and Frida Kahlo. Harriet Tubman’s extraordinary life was celebrated by Google in February 2014. The Doodle features her image and a lamp, to highlight both her escape from slavery and her daring missions to rescue others from the same fate. This feature is notable for a few reasons. In 2014, a study revealed the lack of diversity in Google’s Doodles. Although just a simple design on a search engine landing page, this was a clear reflection of the social impact Google can have. In fact, over half of all Doodles to this point were of white men. Google took this seriously and did strike a 50/50 gender balance in 2014, giving increasing prominence to non-white historical figures too. There is a notable effort to provide a broader spectrum of historical events and figures within Google’s Doodles, beginning with Harriet Tubman. The sculptor Alexander Calder is known best as the inventor of the nursery mobile. These structures sway in the wind, changing form depending on the antecedent forces that come into contact with them. This made Calder the perfect subject for the first Doodle to be constructed entirely using the HTML5 standard. Internet browsers had been incapable of rendering such a complex media format until this point, and this design required the work of a team of engineers, artists, and illustrators. The Doodle, to mark what would have been Calder’s 113th birthday, lulls satisfyingly when a user clicks or hovers over its component parts. This is therefore a particularly important piece of Doodle history, ushering in a new age of innovation and experimentation. To celebrate the 122nd anniversary of Charlie Chaplin’s birth, one of Google’s resident doodlers donned a moustache and hat to pay tribute to the great comic genius of the silent movie era. This was the first live action Doodle and it really comes across as a labor of love from the Google team. Replete with heel clicking, cane waving and bottom kicking, this 2 minute black and white film is the perfect tribute to Chaplin. It also marks the beginning of an era of ambitious Doodles that aren’t afraid to request the audience’s attention for longer than just a few seconds. As such, the Chaplin Doodle is an essential link between the stylized Google logos that were prevalent up to 2011 and the sprawling experiences that would come thereafter. 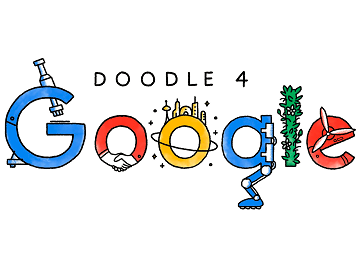 Since 2009, Google has been running its Doodle 4 Google competition. The competition encourages elementary school kids (initially in the US, but this has now expanded internationally) to design a Doodle based on the people and issues that matter most to them. Akilah Johnson was the US winner in 2016 with her entry, ‘My Afrocentric Life’, inspired by the Black Lives Matter movement. Chosen from over 100,000 student submissions, Johnson created the Doodle over the course of two weeks using pencils, crayons and markers. This initiative is a great way for Google to communicate with a younger generation, and it also shows the company’s willingness to give voice to political messages. The greatest composer of all time was given the fitting honor of Google’s most engrossing, intricate, classical music Doodle. Created to celebrate the 245th anniversary of Beethoven’s baptism (his exact birthdate is unknown), this interactive game showcases events in the great artist’s life (both highs and lows), and invites us to piece together movements from his most famous works. This Doodle makes the list for various reasons. It develops a sustained narrative and invites the viewer to interact. It also features some of the greatest art in European history. But primarily, it takes what is sometimes seen as a difficult or impenetrable form of art and makes it accessible. This is an example of Google at its enlightening, playful best. An honorable mention should also go to the Debussy Doodle in this category. Google has an illustrious history of producing Doodles to coincide with national holidays. Everywhere from America to Algeria to Australia has been given the Doodle treatment. However, for sheer fun, the St Patrick’s Day iterations are hard to beat. 2015 was a vintage year, featuring a family of fiddle-playing clovers designed by Irish artist Eamon O’Neill. What makes these Doodles special is Google’s commitment to celebrating such a wide range of holidays worldwide every year. For their brave use of color, the Holi festival animations are particularly worth a look. Google has been honoring International Women’s Day on its homepage for many years, but in 2017 it went the extra mile to provide a comprehensive look at 13 pioneers that have shaped our everyday lives. What makes this most interesting is Google’s desire to go beyond the names we all already know, to give light to some unseen or hidden stories. The slideshow gives prominence to Egypt’s first female pilot and Korea’s first female lawyer, for example. Moreover, it encourages us to do our own research to learn more about each person, instead of simply spoonfeeding us a few quick facts before we move on. The Pac-Man Doodle was a phenomenal success. It deserves an article of its own, really. Said to have cost the economy $120 million in lost labor time, it tapped into our nostalgia for one of the most popular video games of all time. Created for PAC-MAN’s 30th anniversary, the first-ever playable Doodle replicates the experience of the old arcade game. It was initially launched for a two-day period, as Google expected it to surpass the popularity of your everyday Doodle. The fervent response was a little more than they had anticipated, however. Luckily, you can still play the game here. Also worthy of mention are the immensely popular Les Paul Doodle, which now has its own standalone page, and the Doodle Fruit Games, created for the 2016 Olympics. The most recent entry on our list – and perhaps the most expansive in its ambitions – was created to mark the birthday of filmmaker and visual artist Oskar Fishinger. He was fascinated by the links between music and vision, which he saw as inextricable. Google’s interactive take on this is an immersive experience, opening with a quote from the artist before offering us the opportunity to create our own ‘visual music’ using a range of instruments. The Fishinger Doodle is arresting, both visually and sonically. The perfect celebration of Fishinger’s work, in other words. It is an enticing glimpse of the pleasant surprises we can all expect as we log onto Google every morning, as its Doodles grow evermore sophisticated, charming, and instructive.